I’m not particularly keen on so-called “smart” TVs. At first they seem incredibly useful, allowing easy access to the Internet and movie streaming from the comfort of your couch. If you haven’t had one before, you’re likely to be impressed. To me, though, smart TVs seem to be designed for rapid obsolescence. Tightly tied to their manufacturer’s hardware and software, you are reliant on that manufacturer to provide regular software updates to fix bugs and improve the user experience. However, new models are continually being released, and the pace of innovation may mean that your particular model will gradually stop being supported. With this in mind, when I bought a new TV in 2014 I opted for the non-smart option – a good quality Samsung TV that was missing the smart features. This saved me at least £100 on the equivalent smart model. To make up for the missing smart features, I bought a Chromecast for £30 – a small Internet-enabled device that plugs into my TV’s HDMI and USB ports. 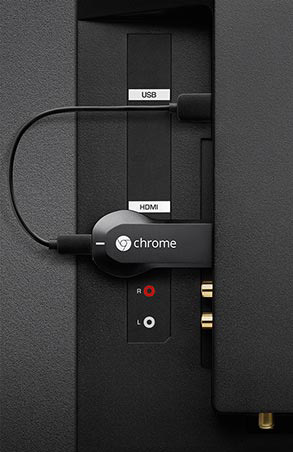 Chromecast is controlled either by the Chrome desktop browser or by compatible apps on mobile devices. They “cast” the media to Chromecast, which displays the media stream on the TV. “Casting” means they instruct Chromecast to download the media directly from the Internet, rather than having your mobile device download the media and relay it to Chromecast. When I bought Chromecast, I thought it was great. It was very easy to plug in and set up, including connecting Chromecast to my Wi-Fi network. Many of the media apps on my Android phone already supported Chromecast so I could easily play videos from the Netflix app as well as from the various catch-up TV services like the BBC iPlayer and have them display on my TV through Chromecast. It was also easy to display Chrome web pages on my TV. There were some downsides to Chromecast, though, at least on my Android phone (I’ve not used it with an iPhone). The Android Chromecast app was slightly flakey, and occasionally I’d need to kill the Netflix process or reboot the phone. Sometimes I’d have to reboot the Chromecast device itself. The lack of a remote control for Chromecast was problematic for visitors – I had to install the app on our babysitter’s phone so she could get Netflix on to the TV. But that resulted in too many devices being connected to our Netflix account. Busy households with lots of visitors could avoid this problem by having a shared phone or tablet permanently available in the living room so that anyone can pick it up and send media to Chromecast, but this inflates the total cost of Chromecast way beyond its initial £30 asking price. These were only minor complaints, though, and I was happy with my Chromecast. But when the Amazon Fire TV Stick became available in the UK during 2015, I thought I’d buy one and give it a go for a few weeks. The price fluctuated, and I was able to get a Fire TV Stick for £25. I unplugged Chromecast from my TV, plugged in the Fire TV Stick, and once I had entered my Wi-Fi credentials I was soon up and running. Almost immediately my favourite feature of Fire TV Stick was its remote control. I hadn’t realised how much I’d missed having one with Chromecast. A smartphone app just isn’t as convenient to use, especially when there are multiple users in a household, and Fire TV Stick’s remote is very simple to operate. A major plus is being able to reverse video easily. The Chromecast app makes it difficult to do this accurately. My babysitter problem is solved too, as anyone can use the remote. I’m also impressed with Fire TV Stick’s on-screen menu system. It’s clean and easy to navigate. Netflix in particular works very well. Fire TV Stick has more highly specified hardware than Chromecast: a dual-core processor, 1 GB RAM and 8 GB of storage as opposed to a single-core processor, 512 MB RAM and 2 GB of storage. Despite this difference, I haven’t noticed any appreciable difference in performance, although perhaps Fire TV Stick is better at caching downloaded video given the larger storage space. Amazon makes a big deal about Fire TV Stick’s gaming capabilities, and even sells an optional game controller to make it easier to play traditional console-style games. I haven’t yet tried any games on Fire TV Stick, but it’s possible that the powerful hardware will have a bigger impact in this area. 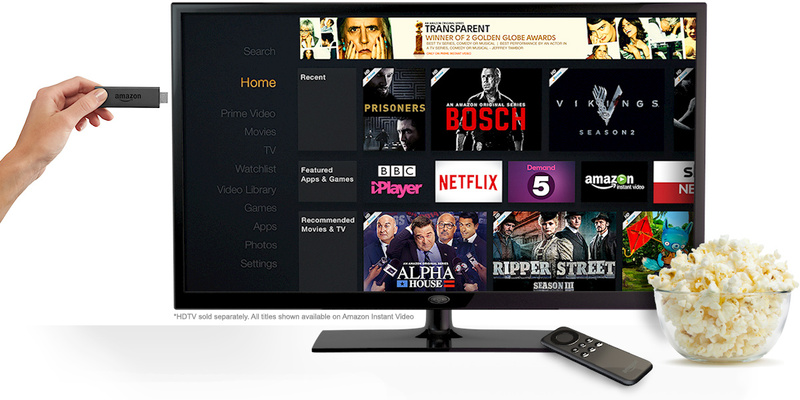 To more thoroughly explore Fire TV Stick I decided to fully commit to Amazon’s ecosystem by subscribing to Amazon Prime for £79 per year. I’m a big buyer from Amazon, and Prime membership includes free one day delivery on most items. It also provides access to Prime Instant Video, Amazon’s video streaming service and one of the only serious competitors to Netflix. There’s considerable overlap in their offerings, but they both have exclusive deals for different TV series. I’m currently enjoying series one of Arrow, which is only available in the UK on Prime Instant Video. In the UK, a television license is required for watching live TV, and it’s expensive – £145 per year! Coming from a country with no TV license (Australia), I don’t like the idea of paying for free-to-air TV, and so I’ve opted out. The cost of Netflix and Prime Instant Video membership each year is about the same as the TV license, and I’ve got thousands of movies and TV shows available instantly. Of course, I can’t watch live TV, but catch-up TV via iPlayer does not require a TV license, so there’s little need for it. I might miss live TV during Wimbleon though, since I enjoy watching the tennis! It was about two weeks ago that I unplugged my Chromecast. It hasn’t made it back yet – I’m enjoying Fire TV Stick too much. I haven’t noticed any significant glitches or frustrations, and so I doubt Chromecast will return to my TV, at least not until Chromecast 2 is released – hopefully with a remote control.